Resource – A Resource is a stock or supply of something useful. Resources can be manmade or Natural. Natural Resources – A Resource which exists in nature is called a Natural Resource. It is not produced by any human being; rather it is available in nature itself. Human beings and other animals depend upon these resources for their existence. Air – The atmosphere which contains different gases such as Oxygen, Nitrogen and carbon dioxide which are required for the survival of life on earth. Water – The hydrosphere which covers almost 75% of the Earth surface. It is a home to an abundance of animals and plants and is also required for the survival of life on earth. Land – The upper crust of the earth is called Lithosphere where different kinds of soils are found which are necessary for the growth of plants and are a home to several vitamins and minerals. Life on Earth is possible because of the presence of these three major sources. 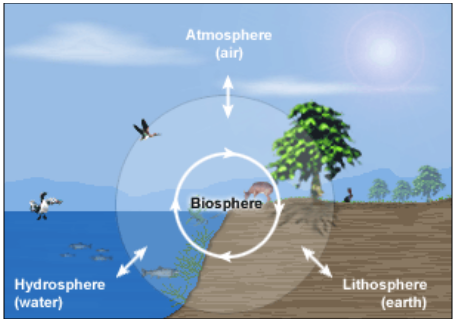 A zone where the lithosphere, the atmosphere and the hydrosphere intersect and the life sustains is called the Biosphere. The air or the atmosphere comprises of various gases. Life is present on the earth because of these gases especially oxygen. Other planets such as Mars and Venus contain majorly carbon dioxide (95% to 97%) that is why life cannot exist there. How much carbon dioxide is produced on earth? The Eukaryotic cells and some prokaryotic cells generate energy by breaking down glucose molecules. This results in the production of carbon dioxide. The process of combustion also leads to the release of carbon dioxide in the atmosphere. How the amount of carbon dioxide is regulated on the earth. The plants present on the earth utilize carbon dioxide present in the atmosphere and release oxygen as a byproduct in the process of photosynthesis. The presence of gases around the earth prevents an increase in the temperature of the earth during the daytime. 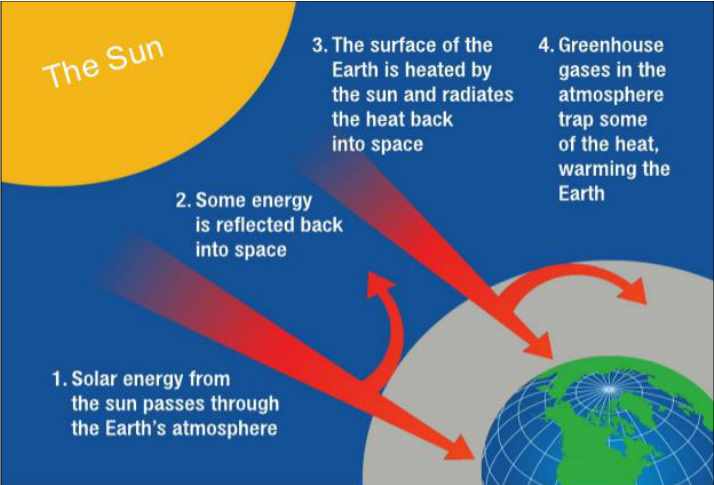 The atmosphere prevents the harmful radiations of the sun from reaching the Earth's surface. The atmosphere prevents the heat of the earth in escaping the earth’s surface during the night time. Moon has no atmosphere hence it faces extreme temperatures ranging from -190 degrees to 110 degrees. The changes in the earth's atmosphere are responsible for Winds, Storms, Breezes and Rains. The formation of water vapour in the atmosphere can take place due to the heating of water bodies and activities of living organisms. The atmosphere can heat up as the earth, water bodies and land, radiate back the heat they absorbed. The land gets heated up or cooled down faster than water. As the air gets heated, it rises above which leads to winds. During the daytime, the land in the coastal areas gets heated faster than the sea. 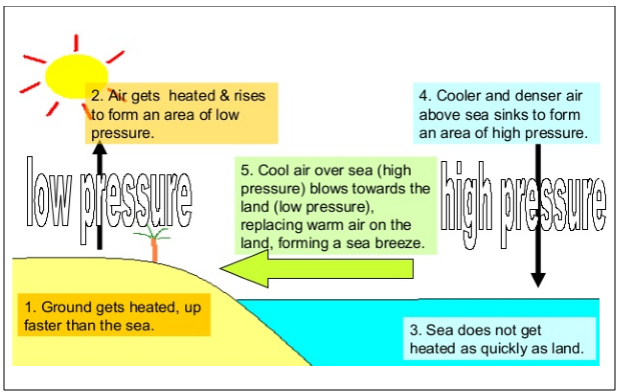 As a result, the air above the land rises above and creates a region of low pressure. 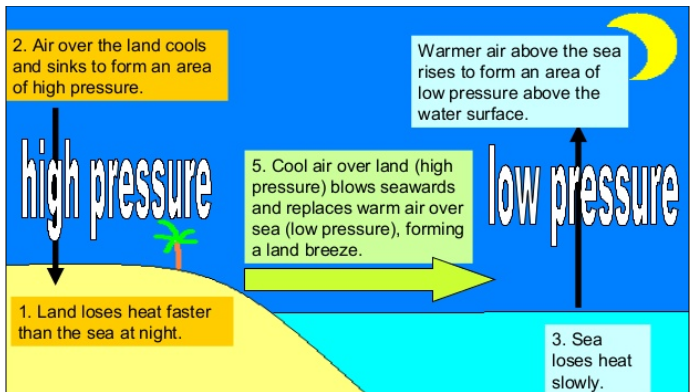 Then, the air above the sea moves to this reason of low pressure. This creates winds in the coastal area during the day. As the water bodies on the earth get heated up water vapour is formed which is carried out in the atmosphere through hot air. When the air rises it expands and cools down. The water vapour present in the air also cools down and forms tiny water droplets. There are other particles such as dust present in the air. These particles act as a nucleus to these droplets. The droplets condensate further and form large droplets and thereby the clouds. Once they become very heavy, they fall off on to the ground as rain. If the temperature of the air is very low it results in snowfall at some places. The winds flowing in an area also affect the rainfall of that place. The presence of harmful substances in the air leads to pollution of the air. It can severely affect the health of living organisms and the quality of the environment. Burning of Fossil Fuels – When coal and petroleum are burnt they release sulphur and nitrogen oxides which are harmful agents. They also release unburnt carbon particles in the air called Hydrocarbons. 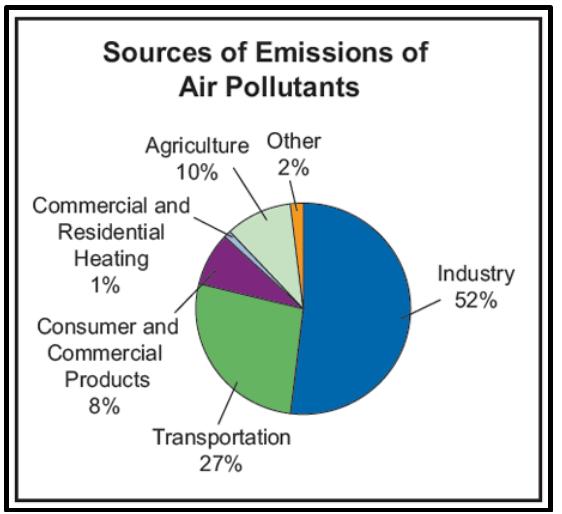 Exhaust from Industries – The industries release harmful gases and smoke in the air that contains carbon monoxide and organic compounds that decrease the quality of the air. 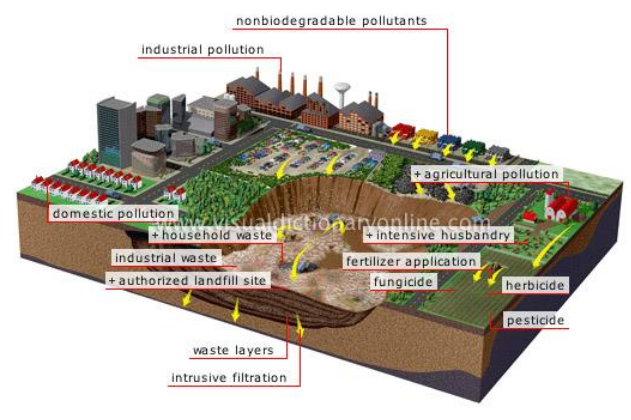 Mining – During the mining process harmful chemicals are released in the air that leads to air pollution. Suspended Particulate Matter – The particles such as dust often remain suspended in the air and degrade its quality. SPM is one of the major causes of air pollution in the cities. 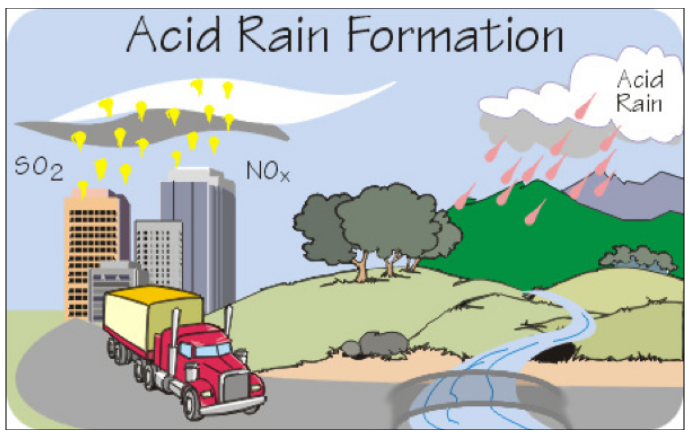 Acid Rains – Rains often contain acidic compounds that can affect animals, plants and crops. 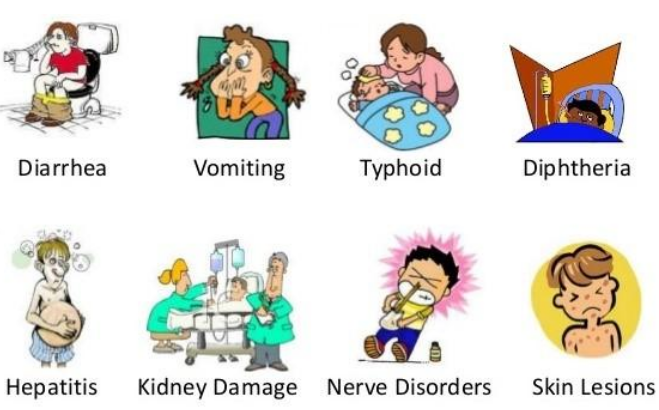 Harmful diseases and allergies – Inhalation of harmful substances can lead to diseases such as heart problems and cancer and allergic reactions in the skin and eyes. A decrease in the visibility – The suspended particles in the air affects the visibility and also lead to the formation of smog in the cold weather. Global Warming – The temperature of the earth rises due to the presence of greenhouse gases in it such as carbon dioxide and methane. Ozone Layer Depletion - The air pollution leads to depletion of the outer covering of the ozone layer around the earth’s atmosphere. Why water is a necessity for life? The presence of water in a region decides the biodiversity of that area to a great extent. The cellular processes take place in the water-like-medium. A major constituent of blood is water which allows it to carry substances throughout the body. Water helps in regulating the body temperature in animals and human beings. It prevents the tissues, organs and cells from drying out by keeping them moist. Water helps in digestion of food. Water helps in the removal of waste products out of the cells. Plants also require water to transport food through different parts such as the stem and leaves and also in the process of photosynthesis. 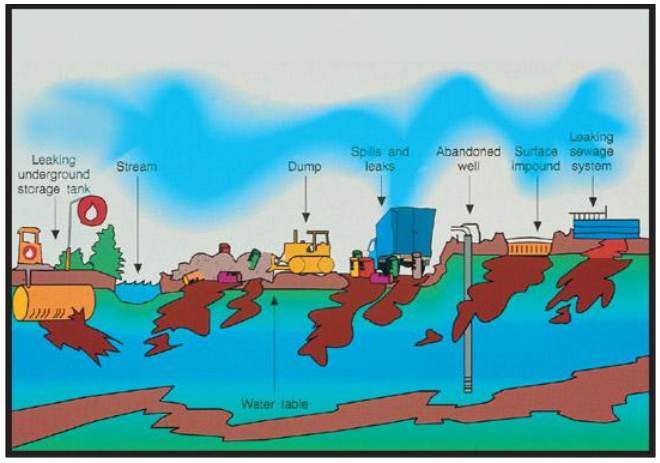 Water pollution occurs when harmful substances such as chemicals and waste materials like garbage are present in water that affect its quality and the presence of life in it. Waste from Industries – The industries often release chemicals directly into water bodies such as rivers and seas which contaminates it. Sewage – The waste produced from households is often released into the water which gives rise to harmful bacteria in the water. Usage of Fertilizers and Pesticides – The chemicals present in fertilizers and pesticides are extremely harmful to aquatic animals, plants as well as animal consumption. Addition of unwanted substances such as fertilizers pesticides and industrial wastes can make it poisonous and extremely harmful for consumption. It can also lead to an increase in bacteria that causes severe diseases like Cholera. Water pollution can lead to a decrease in the amount of Oxygen and nutrients in the water which affects the aquatic life. Water pollution can cause changes in the temperature of water. An increase in temperature is not suitable for all the aquatic animals especially their eggs. The upper layer of the earth called crust stores different nutrients that can help in sustaining life on earth. But they are generally bounded in rocks and mountains. Over a large course of time, these rocks breakdown through some chemical, biological and physical processes which leads to the formation of a nutrient-rich soil. 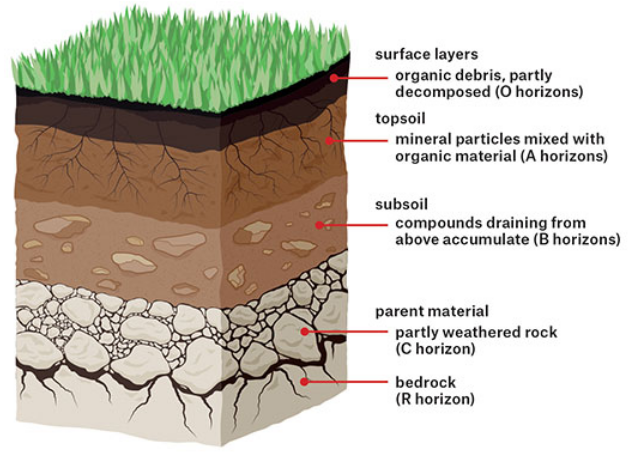 The soil is found in several layers which are arranged as the soil is formed. The layers of the soil are also called as Horizons. These layers have different types of soil particles and colour and hands are differentiated on this basis. The soil profile is defined as the vertical section of soil that represents the sequence of layers to the soil. The layers of the soils help in understanding the usage of that soil. The soil mainly consists of four layers. Such a soil is called Mature Soil. Some types of soils consist of two layers only. They are called Immature Soils. This layer of soil consists of organic matter and decomposed substances. It is dark in colour, porous and can hold air and water in good amounts. Due to such quality, many living organisms are found in the topsoil, for example, the earthworms, fungi and bacteria. Some soils contain a layer of organic matter which consists of a large amount of decomposed leaves and humus. It is called the organic layer of the soil. It lies below the topsoil. It is hard and compact than the topsoil. The subsoil has a light colour because it does not contain much humus. The subsoil does not contain much organic matter other but contains minerals in good quantity and metal salts like iron oxide. When farmers plough their field, they often mix the topsoil and subsoil so that the crops can grow easily. This layer lies beneath the subsoil layer. It is very hard and consists of stones and partly weather pieces of rocks. There is no organic matter in this layer. The roots of plants and trees cannot penetrate up to this layer. It is responsible for breaking down the rocks into smaller pieces and forming cracks in between them. The sun's radiations heat up the rocks during the daytime. As a result, the rocks expand. But during the night, these rocks cool down and therefore contract. All the parts of the rocks may not cool down or heat up at the same time. All this leads to the formation of cracks in them and ultimately breaks them down. Water gets into the cracks of the rocks and freezes down there. This leads to whitening of the cracks. Flowing water often carries pieces of rocks away and on that path they get broken down into smaller pieces as they rub against each other and also due to the pressure of the flowing water. This is one of the reasons why soil is formed far away from the parent Rock. Winds can wear down the rocks and break them. Strong winds rub against the rocks and break them or wear them down just like water. Winds also carry away the soil or sand from one place to another. Lichens that can grow on the rocks and secrete a certain substance that can powder down a rock which leads to the formation of soil. Small plants such as moss often grow on rocks and break them down. It may also happen that the roots of different plants and trees get into the rock’s surface and break it down or widen the cracks. 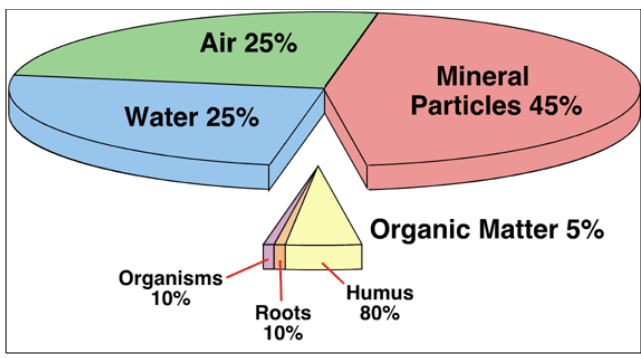 The amount of humus present in the soil – the more the humus the more porous and deep the soil is. All these factors also decide which kind of plants will grow in that soil. Topsoil – The upper layer of the soil which contains all living organisms and humus is called topsoil. The quality of topsoil in a region decides the biodiversity of that place. We know that soil contains different types of substances all of them are responsible for the sustenance of the biodiversity. When the useful components get removed from the soil, it loses its fertility and leads to a decrease in the microscopic life in it. This phenomenon is called soil pollution. Long usage of fertilizers and pesticides leads to the killing of the microorganisms present in it. Without these organisms, the soil would not get recycled and replenished. Earthworms get killed because of the pesticides. They are the ones that lead to the formation of humus in the soil. Flowing water and winds can carry away the soil particles and often lead to exposure of rocks. Deforestation can also lead to soil pollution as the uprooting of trees exposes the soil to rains and winds. Industrial activities like mining and extraction of minerals can lead to a mixture of harmful chemicals in the soil and decay its quality. It severely affects the growth of plants. 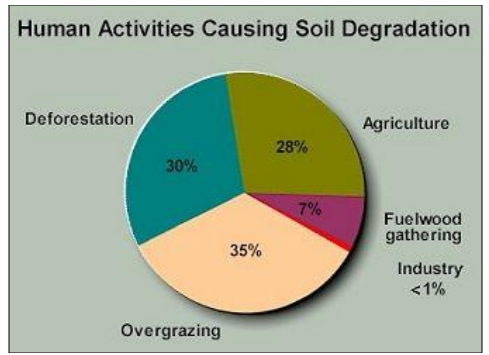 It can lead to infertility of soil and thus would restrict agriculture on such land. The fertilizers decay the quality of the soil. It can affect the health of human beings who consume food grown in soil which has large amounts of fertilizers and pesticides mixed in it. It can change the structure of soil thus decaying the growth of useful bacteria and other microorganisms in the soil. Soil Erosion – It a process in which the upper layer of the soil gets washed away thus leading to degradation in the soil’s quality. Figure 16 What Causes Soil Erosion? How can the roots of plants prevent soil erosion? The roots of the plants bind the soil together and prevent the winds and flowing water to sweep away the soil particles. The plants also lead to the movement of water inside the soil and allow it to reach the deeper layer leading to an increase in the water retention of the soil and the underground water levels. 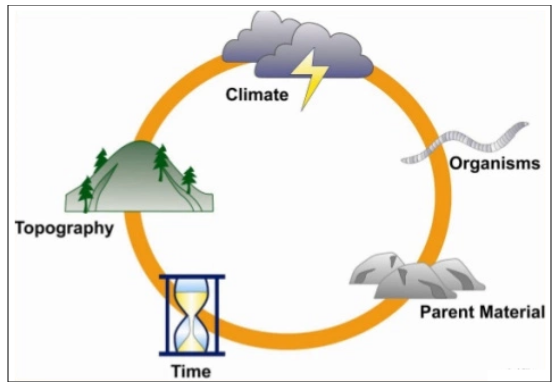 A biochemical cycle refers to the natural cycle of the earth through which a chemical substance or matter moves through the biotic and abiotic components of the earth. These components always interact with each other and form a stable system in the biosphere. Evaporation - Water from the Earth evaporates into water vapours and travels up to the atmosphere. Condensation – The water cools down and forms clouds up in the atmosphere. The water that falls on the earth and travels through different pathways before it finally falls back into the sea and oceans via rivers. Some of the water is also being utilized by the plants, animals and human beings present on the earth. 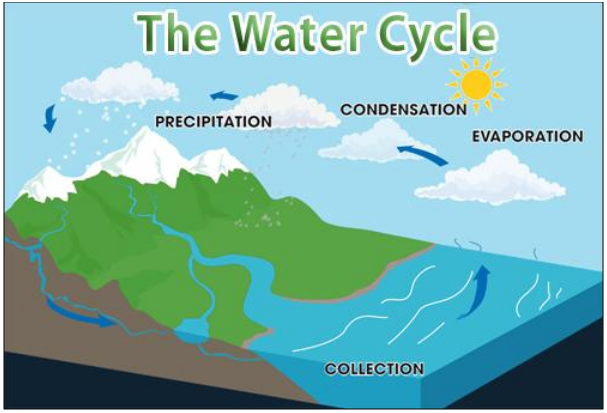 But the journey of water continues in the form of the water cycle. The nitrogen cycle refers to the passage of nitrogen in the atmosphere where it transforms from simple elemental form to complex molecules and vice versa. It is present in abundance (78%) in the air. It is an essential part of proteins and amino acids and therefore the main component of DNA and RNA. It is a common element found in alkaloids and urea. Nitrogen generally exists in its inherent form but in order to be accessed by most living organisms, it must be converted into the organic form. The biological nitrogen fixation process takes place with the help of certain bacteria that are present in the soil, the roots of the plants or sometimes they also live in association with the plants. Another thing that allows nitrogen fixation is lightning. The temperature and pressure on the earth rise during the lightning which results in the formation of nitrogen oxides. These oxides dissolve in water and form nitric acids which fall on land along with rainfall. 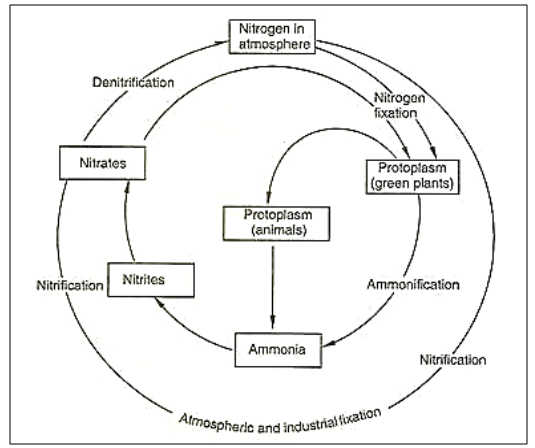 Industrial processes such as the creation of ammonia and nitrogen-rich fertilizers also lead to nitrogen fixation. 3. Nitrification - The ammonia present in the soil is then converted into nitrates and nitrites by the bacteria. This process is called Nitrification. For Example, Nitrobacter is a nitrifying bacterium. 4. Assimilation - The various nitrogen compounds are utilized by plants and animals. Plants form amino acids with these nitrites and nitrates. The amino acids are further used to make proteins in plants. This is the process of assimilation. 5. Ammonification - When the plants and animals die or excrete wastes the nitrogen present in the organic matter enters the soil. The decomposers present in the soil break down these nitrogen compounds into Ammonia. This process is called ammonification. 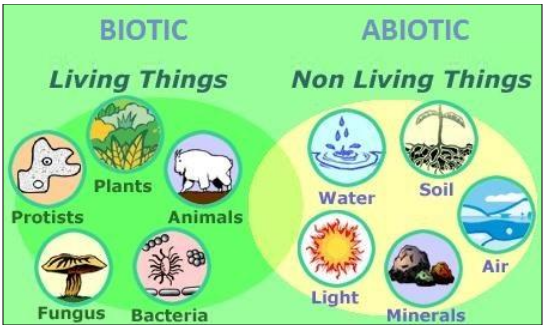 For Example, Bacillus and Clostridium are ammonifying bacteria. 5. Denitrification – In wet soils, it becomes difficult for the microorganisms to breathe. A special type of bacteria called the denitrifying bacteria converts the nitrate oxides present in the soil into oxygen and nitrogen. The oxygen is utilized by the organisms in the soil and the nitrogen is set free. This process is called Denitrification. 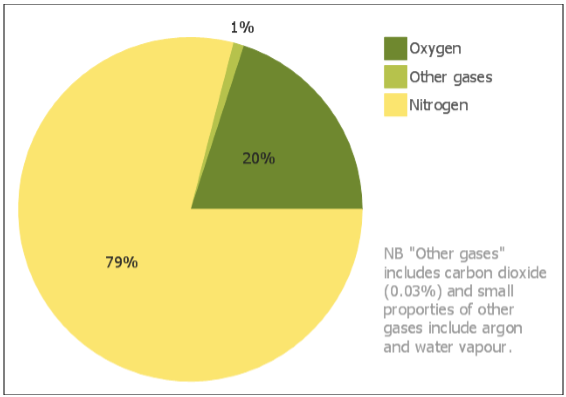 As a result, nitrogen is given back into the environment. For Example, Pseudomonas and Clostridium are denitrifying bacteria. 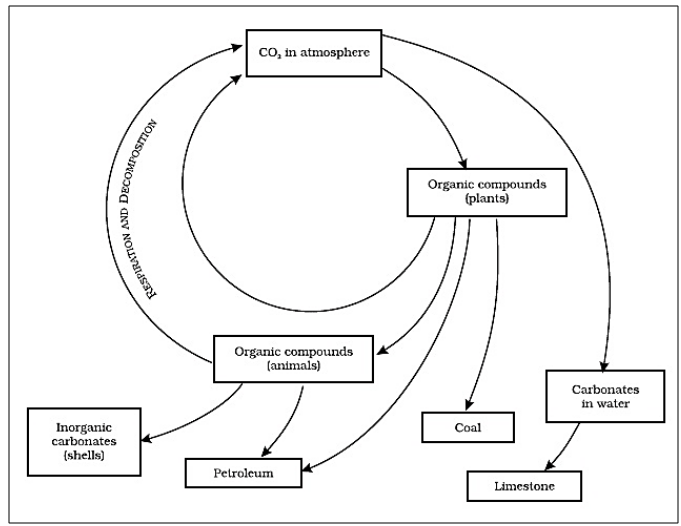 The carbon cycle refers to the process in which carbon is exchanged among the biotic and abiotic components of the earth. The internal skeleton (endoskeleton) and external skeleton (exoskeleton) in animals is made up of carbon salts. How carbon is released back to the atmosphere? 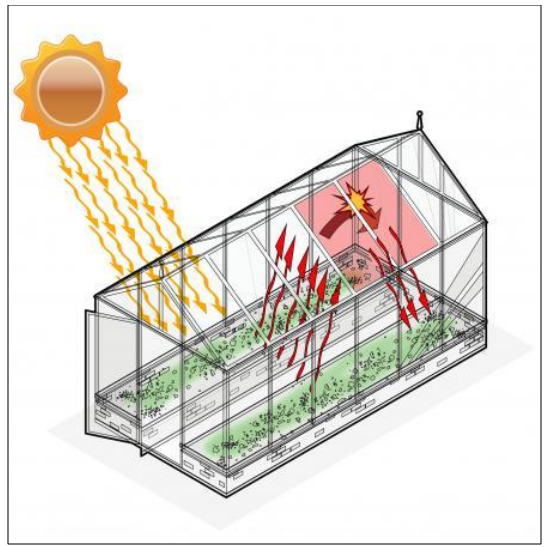 Greenhouse – It is a house like structure made up of a transparent material such as glass. This provides plants with an appropriate environment that supports their growth, especially in the cold regions. This is possible because the greenhouse traps the heat inside it and prevents it from going out. Greenhouse Gases - The gases that cause greenhouse effect are called greenhouse gases such as carbon dioxide, methane and ozone. Global warming - The phenomenon in which the average temperature of the earth increases due to the presence of greenhouse gases is called Global Warming. Increase in the Average temperature of the Earth - Global Warming and greenhouse effect has lead to a severe change in the climate of the earth and an increase in the global temperature which can severely affect the biodiversity on earth. One of the major consequences is the melting of ice caps on the earth. Increase in the temperature of the oceans - This affects the aquatic life to a great extent. Many aquatic animals cannot survive in hot water. Severe weather conditions - Many parts of the world are facing extreme hot or extreme cold climate due to the increase in Earth's temperature. As a result, some places receive heavy rainfall while others face droughts. Warmer Winters - The winter season in many places on the earth has decreased due to global warming. Infertile lands – Many irrigational areas can become infertile for agriculture due to change in the weather conditions of a place. Therefore, it also affects the agricultural pattern and availability of food all over the world. Effect on animals - The migration and hibernation of many animals are affected due to change in the climate of the Earth. Global Warming can also lead to the extinction of many animals because of their inability to adapt according to the changing environment. Flooding of islands and coastal areas - The melting of ice caps has resulted in increased sea levels all over the world. Increase in diseases - Global warming and the greenhouse effect lead to spread of diseases related to the heart, respiration and eyes all over the world. Apart from these, global warming leads to infectious diseases like cholera, malaria and dengue. 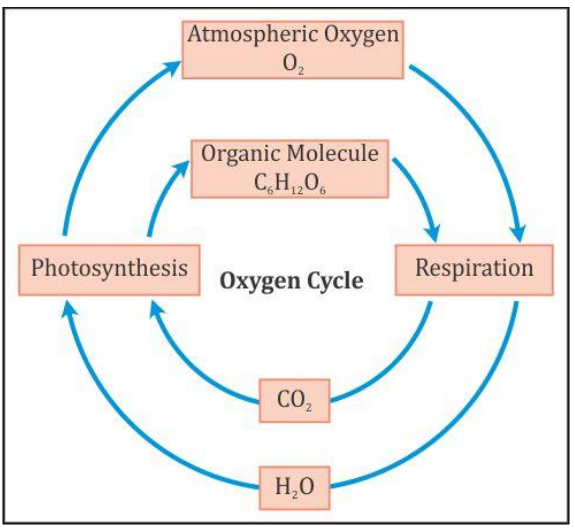 Oxygen cycle refers to the maintenance of the amount of oxygen present in the atmosphere. It is the second most abundant gas present in the atmosphere (21%). It is found in the earth's crust as oxides in metals and minerals. It is also found in biological compounds like proteins, nucleic acids, carbohydrates and fats. Oxygen is returned back to the environment by the process of photosynthesis only. That is why it is very important to grow more and more plants so that more amount of oxygen can be returned back to the atmosphere. 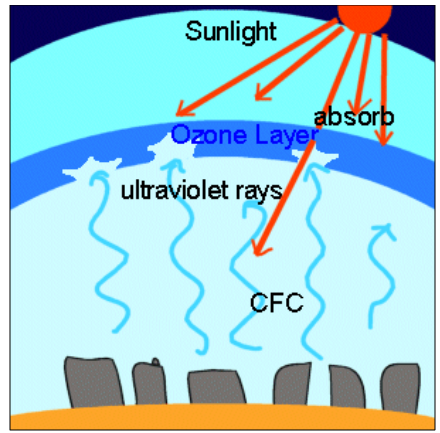 The upper layer of the atmosphere of the Earth is covered by a gas called Ozone (O3). This gas is poisonous in nature but it doesn't affect the life as it is found far away from the biosphere. The Ozone Layer acts as a shield and prevents the harmful ultraviolet rays of the sun from reaching the Earth's surface. In this way, it allows the survival of life on earth. It has been discovered that the Ozone Layer is getting depleted from the earth's atmosphere. A hole in Ozone Layer has been found over Antarctica. This is mainly because of the presence of the Chlorofluorocarbons (CFCs) in the atmosphere. These are released due to industrial processes, refrigeration, aerosols, foams and solvents. The chlorine and fluorine present in these on reaching the Ozone Layer react with it to form complex compounds and it thus results in depletion of Ozone.